Every homeowner finds himself confronted with the frustrating problem of dust in the home. Regardless of what steps and techniques you take to get rid of the dust, it may seem like wasted efforts. As soon as you finish dusting, within just a few days, you may find yourself dusting all over again. You repeat the scenario over and over again for the simple reason that without dusting you risk the chance of dust mites creating allergens in your home. So, of course, dusting becomes a constant habit. 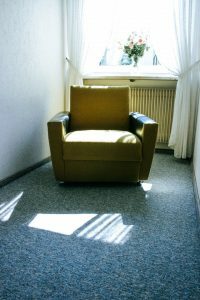 What actually causes the overwhelming dust in our homes and what can we do to minimize or get rid the dust altogether? 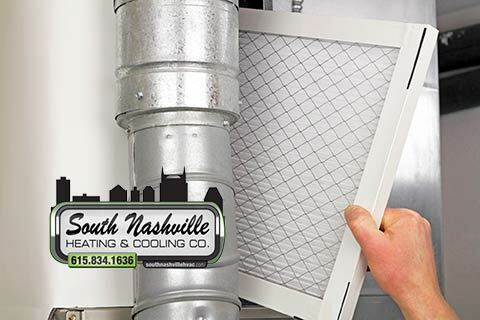 The folks here at South Nashville Heating & Cooling fully understand your frustration and would like to share with you the three primary causes of dust in your home and what you can do to take care of the problem. First, for those who have carpet, it will harbor all sorts of dust and dust mites. When you clean your carpet by vacuuming, you may think you are cleaning and getting rid of the dust problem. In reality, you are actually making the problem worse. Studies have proven that vacuuming can release and then re-suspend dust and other allergens which leads to an increased exposure. With that said, we highly recommend that you either switch over to hardwood or tile floors or you invest in a vacuum cleaner that has a high efficiency particulate air (HEPA) filter. HEPA filters catch all types of particles that are .3 microns or larger in size and do so at an efficiency level of 99.97%. Second, the use of cheap air filters such as thin fiberglass air filters does little to nothing at all when it comes to catching small particles such as dust. Because of the lack of efficiency of cheap filters, the AC evaporator coil in your HVAC system is allowed to get dirty faster and recirculates airborne dust throughout your entire home. If you find that your filters rarely get dirty and that you only have to change them once in a long while, then the chances are they are not appropriately and effectively catching the dust in your home’s environment. The best solution here is to buy air filters that have higher MERV ratings. The higher the MERV rating, the greater ability to capture smaller particles like dust. Fiberglass filters are usually rated between a 1 and a 4. To combat your dust problem, you want to invest and use filters that have a rating that are in the range of 5-8. If you are using pleated filters, we strongly recommend that you change them more frequently since they get dirtier, faster. You do not want to leave a dirty filter within your return grill since this can contribute negatively to the performance of your heating and cooling system. Third and finally, the air duct system in your home may very well be sucking in dust and other allergens from your attic space and other remote places in your home distributing the dust throughout your living space. Energy Star studies tell us that a typical home will lose about 20 to 30% of the air that flows through the ductwork of a forced-air heating and cooling system. The air seeps through holes or gaps that exist around fittings or seeps through unsealed joints that lie between separate duct sections. When this occurs, dirty and dusty air from the unconditioned spaces gets into your system’s ductwork and blows the dust and other particles into those spaces within your home that are conditioned. 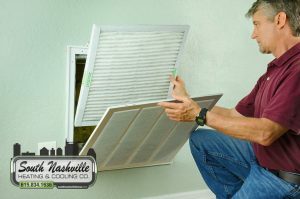 Dust poses a major problem for all homeowners, but the team here at South Nashville Heating & Cooling hope that our insight helps you to better understand what causes the dust and what you can do to combat the problem. Also, remember that if you are in need of any heating and cooling products or services, then we are the team for you. Whatever the reason, whatever the season that you may need HVAC services, be sure to reach out to our friendly and professional team. We look forward to serving you with all your HVAC needs, whether winter, spring, summer or fall. What is the Proper Air Conditioner Size For My Home?